Last night Narc Out the Reds headlined a great show at Mac’s Bar that also featured Calliope, Infernal Names, the Guest Stars, and Little American Champ. Aside from the fact that it was a diverse bill stacked with talented bands, it was a special night because it was the last show featuring Narc Out the Reds bassist Terry Pearson and the first show to feature new bassist Josh Siwek. Narc Out the Reds played an hour long set hitting most of their Are On the Run EP, both sides of their Pawnmower/ Leak in the Disease 7-inch, as well as new material for a forthcoming release and their revamped version of The Ones’ “You Haven’t Seen My Love” from the recent Secret Identities compilation. It was a great performance, bittersweet as Terry is a cool guy and it’s too bad that he can’t play with the band anymore (he recently moved back to Escanaba, MI) but also very promising as Josh, longtime bassist for Lansing band The Playback, immediately fit right in with the band, showing that they’re not going to lose any momentum. I’ve seen Narc Out the Reds dozens of times and seen them go through many changes over the years. 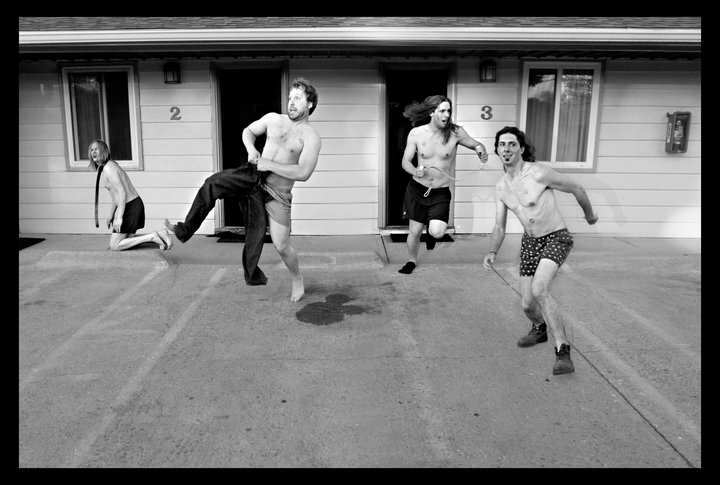 I’m not any sort of authority on the earlier days of the band, but I know the band has been through many variations, with some songs dating, in some form, to the great Lansing band The Caustic Pop (Chris’ band from the mid-90s to the early 00s) and the short-lived Things Without Wings (circa 2005/6 or so), a band that essentially split into The Hat Madder and Narc Out the Reds. This is a bit of guesswork on my part as I didn’t really know any of these guys until mid-2008 or so (in fact I think we should have Chris – randomly joined by Isaac – do a podcast or something and have him ramble about vague band histories and whatever else he feels like ranting about; I think it would be some solid gold reporting), but I do know that Hattie and I were at the first Narc Out the Reds show at (SCENE) Metrospace in spring 2008 and were immediately fans of the band. I recall reading an article in either City Pulse or Noise that Chris Baratono, formerly of The Caustic Pop, had a new band that would be making their debut. Eric Merckling (see the article entitled “CrookedSound“) had mentioned at various points that The Caustic Pop were one of his favorite bands from Lansing, so we made it a point to check out this dude’s band and were glad that we did. I’m not quite sure when Ben Southwell entered the picture in the whole scheme of things, but he was firmly in the band at that first show, Chris’ onstage foil, conjuring up crazy guitar sounds and adding surprisingly sweet vocal harmonies. Like I said before, I didn’t know these guys at all at the time, so I’m not even quite sure who the bassist and drummer were, but I think the bassist was Dave Brunger who would go on to be a member of The Hat Madder. There is a lot of cross-pollination between The Hat Madder and Narc Out the Reds, and Hat Madder honcho Isaac was at this first show as well – and this video that I found online proves that we were both there, and apparently both in furious head nodding moods (around the 2:25 mark). I don’t think Isaac and I really knew each other then either, but, hey, there we are. Narc Out the Reds immediately reminded me of Shudder to Think and I was definitely excited to have this band playing in my town. We ended up becoming friends with Chris during 2008 when Todd Karenin was promoting “New Music Mondays” at the Rendezvous on the Grand in Old Town Lansing, a weekly showcase of independent bands that became a bit of a hangout for local musicians. Chris lived around the corner from the bar so he was usually at the shows, and at some point after seeing each other every week Hattie and I became friends with Chris, often joined by Isaac, which began the process of Narc Out the Reds and The Hat Madder entering the GTG fold. By this point the drummer of Narc Out the Reds was Ben Godoshian, who added falsetto harmonies and a wild abandon to the live performances, which often culminated, fittingly, in the form of The Who song “Pictures of Lily” as the set closer. (This is where I would insert a video of this song, if such a thing existed. 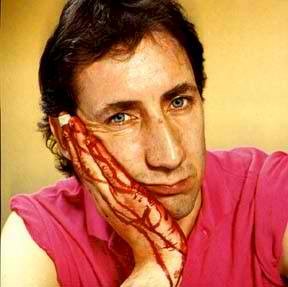 Instead I’m going to post my favorite picture of Pete Townshend). 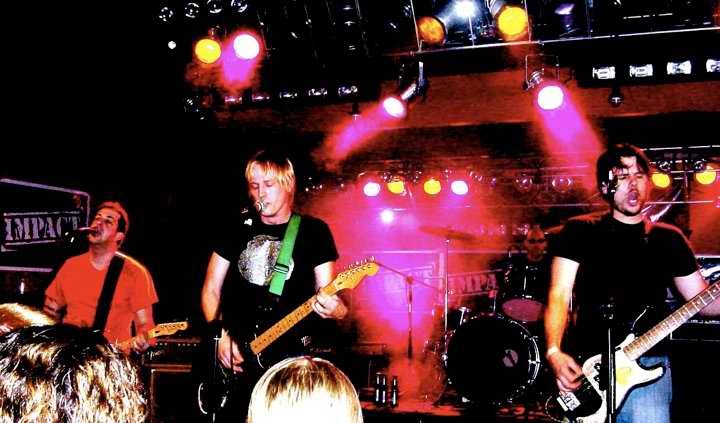 By early 2009 The Plurals and Narc Out the Reds had played together several times, and Narc out the Reds was also searching for a new rhythm section with Dave and Ben G both parting with the band. Drummer John Miller and bassist Terry Pearson, then of Lansing metal band Intrusion, entered the picture at this point, which stabilized the band at long last, allowing the years-in-the-works …Are on the Run EP to be finished and released the following spring. John and Terry brought a lot of energy to the show, and I recall being at the first show with the new lineup and thinking that “this” was the band, at last. This lineup recorded and released the slew of compilation songs that appeared in 2009-2011 as well as the stellar Pawnmower/ Leak in the Disease 7-inch, in addition to dozens of memorable shows. The whole GTG Records experience has brought me in contact with a lot of great bands and musicians, and I’m definitely pleased that Narc Out the Reds is one of them. I wish Terry good luck and hope he knows that he always has friends and a home with the GTG crew.